My brother (soon to have 3 kids) needs to lease a car for my sister-in-law's commute and the occassional family hauling. Lease for around $500 a month for 3 years. He does have a Pilot for heavy duty family hauling. I do not want to recommend him a large sedan as he also wants to have some fun. He currently leases a BMW 3 series. Are there midsize sedans out there which can fit three car seas at the back? They are as big as large sedans these days. I agree, a sedan is not a good idea, but he wants one. By the way, he is brand conscious. 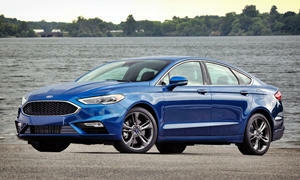 Answering my own question:) I am leaning towards Ford Fusion and Mazda 6. Lot of safety gadgets, any opinion? I have a Nissan Altima and we have 3 young kids. While we mostly use our Mini-van for long trips and hauling the children around, I have found the Altima's backseat handled the 3 car seats more than adequately. Obviously head room is a bit of a problem trying to squeeze kids in but you'll run into that issue with all sedans. Getting access to the middle seat is also a bit difficult but we always put our oldest there since she can buckle and get herself into her seat without intervention. Now that our two oldest can use booster seats, there really is ample room for 2 boosters and a regular (front-facing now) car seat. 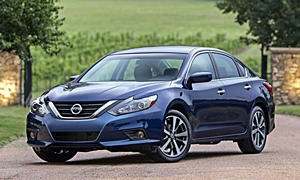 I enjoy the Altima's driving experience so I think it's a good combination of utility and driving. 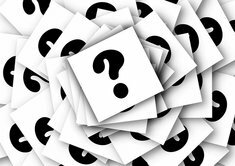 If he's brand conscious, will he consider a Ford or a Mazda? $500 can lease quite a bit of car. 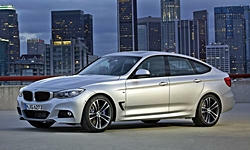 A BMW 3-Series Gran Turismo (review) seems to often be my answer lately. It's considerably roomier than the regular 3-Series, for the same price. It also has a higher driving position than a regular 3, which is good for drivers well under six feet tall. It's not a sedan, but it's not a wagon or a crossover, either. 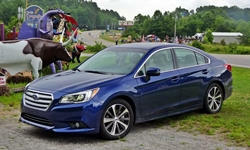 Coming up later in 2014 will be the new 2015 Subaru Legacy. It is taking a big step up in the technology and safety features department including their EyeSight technology which offers front collision brake assist, lane departure warning, blind spot warning, backup camera, rear cross traffic alerts, etc. It will also feature a 2.5 liter 4-cyl engine that will be able to make 28/36mpg mated to a continuosly variable transmission. Not to mention Subaru's standard AWD system with a revision of their vehicle dynamics control called Active Torque Vectoring which was also put into the new 2015 WRX/STi to help with keeping the car very neutral in corners. I can fit my three children in the back of my 2010 Legacy (Rear-facing, booster seat, high-back booster), with no problems and I'm pretty tall (6'4"). 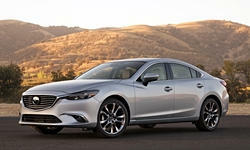 Both the Fusion and Mazda6 are impressive sedans, in slightly different ways. I've compared them twice, with automatic and manual transmissions.